Every maker has a story. 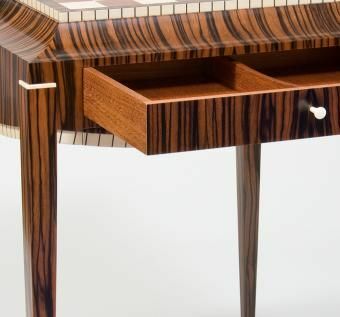 Be a part of Ct Fine Furniture By Craig Thibodeau's story by placing an order, leaving a review, and seeing your review appear here. 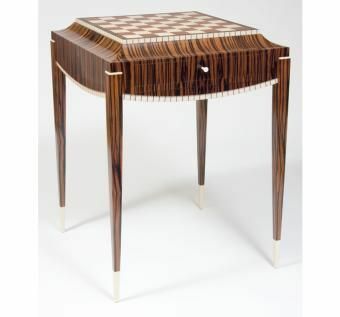 An original Art Deco inspired Chess Table in Macassar Ebony with a playing surface of Bubinga and Holly squares framed with Ebony and Holly inlay. 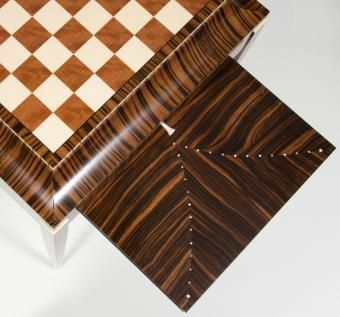 There is one drawer for chess piece storage and a slide out tray decorated with Mother of Pearl inlay to hold captured pieces during the game. The finish is Satin Conversion Varnish.